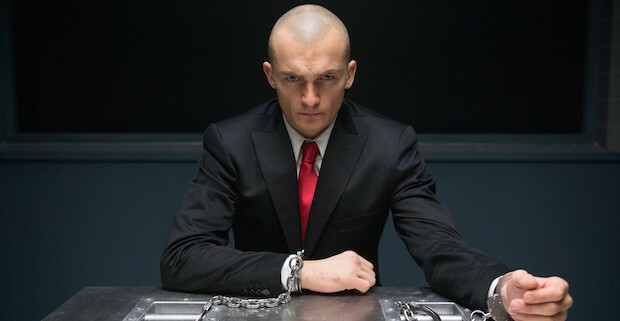 Big, dumb, loud and long, Hitman: Agent 47 is one of the worst video game adaptations ever made. This is not an opinion, but rather a matter of fact. In a world where we have seen Super Mario Bros turned into real-life plumbers who travel to a town called ‘DinoHattan,’ Aleksander Bach’s directorial debut has found a way to make gaming culture seem stupider than ever before. If I weren’t so disgusted I might actually be half impressed, but I’m not. I’m just disappointed. One would think a movie based on a game about an assassin who was genetically bred to lack all the things that hold people back from being perfect killing machines would write itself, but you would be mistaken. Hitman: Agent 47 is ridiculously overcomplicated from the opening credits, which involve no less than three minutes of narration detailing the entire history of the Agent program, its founder, and the current search to find him. You also learn about his daughter, Diana, who you will meet several minutes later. It’s all very detailed, but it’s mostly information the average person could pick up with only a few minutes of actual story unfolding on screen. Then again, that would force you to think, and if there is one thing Agent 47 wants to prevent it’s making you think. When we actually meet Agent 47 he is cold and distant, which is true to his legendary demeanor. The protagonist of the Hitman franchise is largely, if not entirely silent, so it’s on the actor’s phyiscal performance to sell us on his menacing nature. Rupert Friend does his best to sell himself as someone you wouldn’t want to mess with, but he lacks the commanding presence you need in a true action hero. He’s neither stoic nor suave, just empty. Emotionless. Had Bach designed the rest of his film to work with this aesthetic Friend’s performance may have leapt to life, but as is he’s a cardboard cutout running loose in a three-dimensional world. And, oh what a world it is. Agent 47 exists in one of those wonderful universes where there is always a slew of faceless, nameless bad guys in need of a good killing. The film is essentially a series of elaborate shoot-outs involving Agent 47 and an endless array of meaningless bad guys with many poorly written and largely uninteresting sequences of exposition in between. The action is chaotic, but always incredibly contained. There is no pulse to anything happening on screen. No tension. It all just happens, with plenty of booming music cues underneath, and when it’s over you realize you never felt a thing at all. It might have looked cool, for a moment, but that it was fleeting beauty at best. Zachary Quinto, tasked with being the ultra-tough bad guy no one should have ever cast him as, is a downright laughable villain. There is a whole plot involving an evil corporation that we could get into, but at the end of the day everything essentially boils down to two men who are basically super human doing their best to punch, shoot, and/or kick the crap out of one another. There are many things Quinto is capable of conveying on screen, but this evildoer trope is not one of them. Hitman: Agent 47 is the kind of film that could very well set back major studio views on video game adaptations for the next five to ten years. It’s not only one of the worst films of 2015, but also one of the worst theatrically released action films I’ve ever seen. Every single thing about this movie is nauseating, from the script and performances, to the CGI, editing, and perhaps worst of all, Alexander Bach’s over-reliance on slow-motion. It’s not that cool, Bach. Not at all. I will spend the next six months regretting the fact I spent almost two hours of my life watching this film. Don’t be like me, and don’t let your friends be like me either. Friends don’t let friends watch Hitman: Agent 47.